God loves us (vs 16a): “For God so loved the world, that he gave his only begotten Son” – In this verse “God” (the designation of the divine nature) is used of the Father, who gave his Son. God is a loving God (2 Corinthians 13:11; 1 John 4:8,16). The object of love is “the world,” (kosmos), a broad word that here refers to all humanity. God doesn’t limit this love only to the Jewish people or to believers, but to all of humanity. It is this great love of God that motivates us to love Him & love others. “We love, because He first loved us” 1 Jn.4:19. The word love ‘agape‘ is not talking about an emotional love nor has the definition of love or romanticism the world understand, but agape is ‘benevolence, good will’ it is an act of the will, a selfless, sacrificial love that cares & constantly seeks the benefit of the other person. Agape love is active. It demonstrates love through actions. Please see 1 Cor.13. This is the love that God has for us, the reason He gave His son & also the love that moved Jesus to voluntarily die for us in the cross (John 10:18). The world cannot teach us this love, because it comes from God. In Galatians 5:22 we learn that ‘agape’ love is the fruit of the Spirit. The ancient Greek had 4 terms to define ‘love’: ‘Agape’, ‘Phileo‘, denoting personal attachment, friendship, brotherly love, this is a feeling, a fondness. You can find both terms in Jn. 21:16. Storge (natural love and affection of a parent for their child, family loyalty). Rom.9:10 translated ‘kindly affectioned’, & Eros (romantic love). God wants us to hate evil or sin (Rom.9:10), but to love one another (Jn.13:35), love our neighbors , & even love (agape) our enemies. Matt. 5:44. Also let us not forget that LOVE . . . rejoices not in iniquity, but rejoices in the truth. 1 Cor.13:6. On one hand God loves the sinner (Romans 5 :8; 1 John 4:10), but on the other hand God hates sin or evil. Sin separate us from God (Is. 59:2, Jer.5:25), it blinds us to the truth (1 Jn.2:11) & we will perish if we stay in our sins. ‘But God proves His love for us in this: While we were still sinners, Christ died for us‘ (Rom.5:8). There are some that teach that God hates sinners & to prove it they use Psalm 5:5 :” You hate all workers of iniquity“. The Hebrew word for iniquity H520 “âven” literally means “perverseness, wickedness“. Iniquity is sin at its worst. Iniquity is premeditated, continuing with out repentance & escalating sin (Job 6:29). God hates (without sinful intent, not like men hate) these type of sinners, He abandons/gives them over to a reprobate mind, because they had harden their hearts. Please check also ‘Iniquity‘. There is a use of the word hate today that means malicious, which is incompatible with love/benevolence, and this type of hate God does not have (Deut.32:4, Psalm 5:4) He is Holy! The word hate is used in the bible to describe to ‘love less’ or to ‘reject’ (Gen.29:30-31), disgust, etc. That type of hate can certainly co-exist with benevolence, so there is no contradiction when we properly understand the meaning of these words. We can find that the object of God’s hatred is always evil and wickedness. And when referring to people it’s because of their continual unrepented sin, or iniquity. It is not, that for no reason at all God decided to only love a few people (or the elected, according to Reformed /Calvinist doctrine) & hate the rest or non-elected. 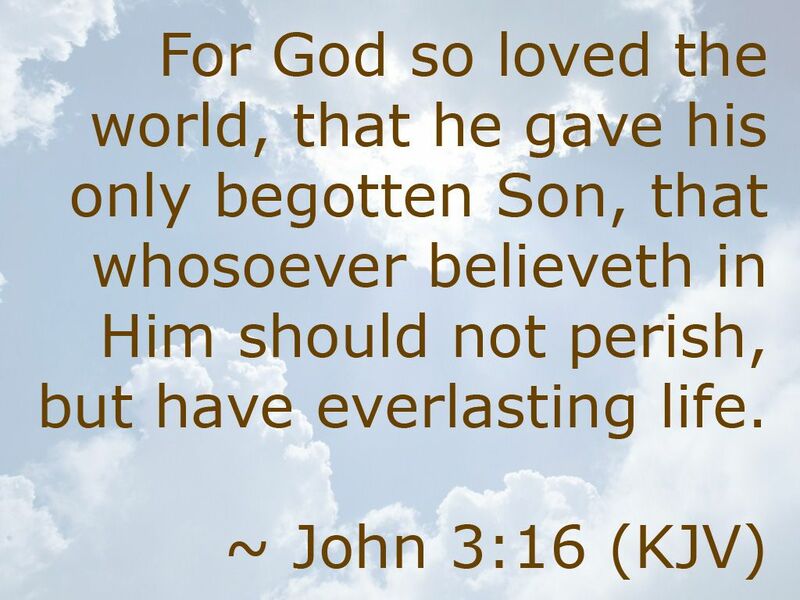 – The second part of that verse John 3:16b says: “that whosoever believeth in Him should not perish, but have everlasting life“. God loves the whole world and wants ALL to be saved, He longs to have a relationship with us, but He will force no one to yield to His plan. who gave Himself as a ransom for all. This was the testimony given at the proper time. 1 Timothy 2:6. For the grace of God that bringeth salvation hath appeared to all men” Titus 2:11. Behold the Lamb of God, which taketh away the sin of the world” John 1:29. Any denomination that changes or limits the atoning sacrifice of Christ to be only for a few chosen ones, is contradicting God’s Word & changing the gospel! “The word that I have spoken will judge him in the last day“. The concept of a ‘Limited Atonement’ means that Jesus didn’t die for everyone, but only for a limited or selected group, namely Calvinism’s “elect” or the ‘Israelites’ alone, or the Awakened Ephraimites, or the Jehovah’s witnesses’ elect, etc. The rest or the alleged “non-elect” wouldn’t have a Savior who really died for them, BUT if they didn’t have a Savior, then how can they be held accountable for rejecting a Savior that they never had? So a Calvinist (or any ‘elected one’) would then have to say that the rest are not condemned for rejecting the grace of Calvary, or for not believing Jesus, but because of their sin or because God hated them for no reason. However, that’s not at all what Jesus said. What is the reason some are condemned & some are not? because of election? sins? not being of a particular race, an Israelite or an awakened Ephraimite? No, none of those, but because of FAITH! Either they believe HIM or they don’t. We all have a choice to make, either we believe God or we believe that other voice, we have the same choice as Adam & Eve! If we reject the Word of God as our only authority, then we are rejecting God’s authority, the Truth & we will be on our way to deception, we will accept a lie. God is light & in Him there is not darkness at all. 1 John 1:5, Jews knew God is light: Psalm 27:1, Habakkuk 3:4, Hosea 6:5, Isaiah 51:4, 1. “God, who at various times and in diverse ways spoke long ago to the fathers through the prophets, 2 has in these last days spoken to us by His Son, whom He has appointed heir of all things, and through whom He made the world.” Hebrews 1:1-3. Today we proclaim His spoken words. “The hour…now is, when the dead shall hear the voice of the Son of God: and they that hear shall live” (John:5:25). In whom ye also trusted, after that ye heard the word of truth, the gospel of your salvation: in whom also after that ye believed, ye were sealed with that holy Spirit of promise. Eph. 1:13. Then why some people are able to believe or have faith & some others don’t ? First, it is necessary for the gospel of Christ to be preached so that sinners can hear, then believe & be saved. Many haven’t heard the real gospel, some have heard a counterfeit & many others are trying to be good or doing good works to attain salvation. This is the reason we must preach the true gospel to every person, in every nation, in the whole world (Matthew 28:19, 20; Mark 16:15,16; Luke 24:46, 47). Second, I recommend you to read the Parable of the Sower. The seed, is the Word of God & it’s given to everybody when we preach the gospel, but it depends on the condition of the heart (soil/ground) to receive it, keep it & then give fruit.